Croft theses must be double-spaced, set in 12-point font, with one-inch margins on the left, right, top and bottom. If you are in the Honors College, you can set your inner margin to one and a half inches to comply their with their requirements. The thesis target length of 40-50 pages does not include the bibliography and the notes. The thesis mentor has discretion to approve a longer or shorter thesis. Notes may be either endnotes or footnotes, at the discretion of the thesis mentor. Note and bibliography format is at the discretion of the thesis mentor, but must conform to a generally accepted format in the academic discipline. Croft students who are also students in the Sally McDonnell Barksdale Honors College should check with the Honors College to obtain prior approval for the length, formatting, and other appearance requirements of their Croft thesis. 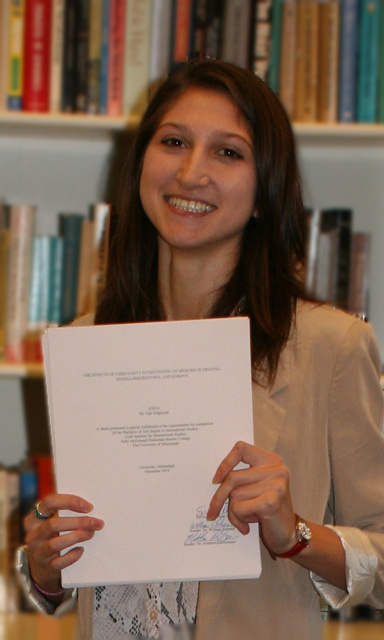 The format for the title page of the senior thesis includes the title, author, semester of presentation, and the words, "Presented in partial fulfillment of the requirements for completion of the Bachelor of Arts degree in International Studies at the Croft Institute for International Studies."